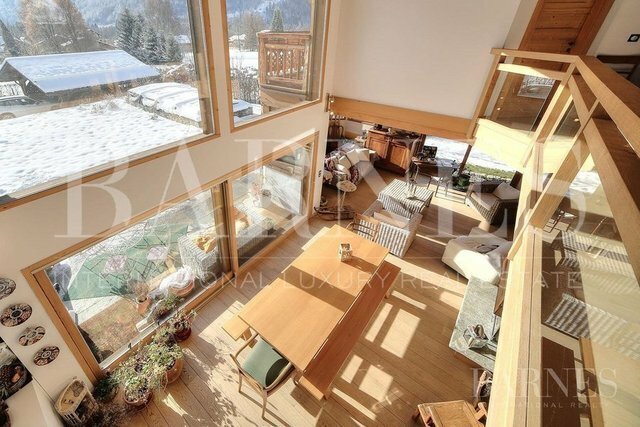 Spacious 285 m2 chalet sitting on 2,500 m2 of land, offering the possibility to build an additional chalet with a floor surface of 150 m2. The property comprises a laundry room, shower room, cellar and large games room on the basement. Ground floor: entrance, toilet, kitchen, dining room featuring high ceilings, double lounge with a central fireplace. Garden, terrace and spacious jacuzzi facing Mont Blanc. First floor: 3 bedrooms (including one with a balcony), two shower rooms, toilet. Second floor: suite with bathroom, toilet, fireplace and balcony.